Stelmax 1985 Adhesive is an easily applied PVC resin and solvent based mix which bonds readily to form maintenance free joints of exceptional strength when used to bond both plasticised and rigid PVC and ABS. 1985 Adhesive is used extensively within the window industry for the installation of frames and attachments and is particularly suitable where bonding is only possible over small and narrow surface areas, When dry the product will exhibit weathering, UV and chemical resistance similar to that of a good quality rigid PVC. 1985 Adhesive is primarily available in both Clear and White format with other colours available on request. For all enquiries please refer to the contact details listed. 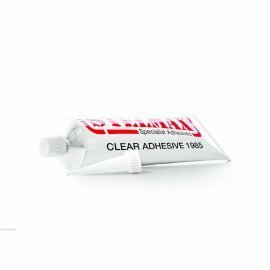 This product is an ADHESIVE and is not designed to be used as a gap filler and thus exhibits no gap filling properties that are characteristic with Stelmax gap filler sealants, This product should also not be used in conjunction with activators. Due to the many applications and variety of substrates on the market, it is the end users sole responsibility to ensure that this product is suitable for its intended application and the products compatibility with all materials, Information in this publication and otherwise supplied to users is based on our general experience and is given in good faith, but because of the many particular factors which are outside our knowledge and control and which may affect the use of these products, no warranty is given or is implied with respect to such information, Stelmax Limited reserves the right to alter specifications without prior notice at any time, as our policy is one of constant improvement.